We had the chance to chat historical challenges, 19th century Edinburgh and class divides with Ambrose Parry, the pseudonym for award-winning crime writer Chris Brookmyre and medical historian Marisa Haetzman. Parry's novel, The Way of All Flesh is out now (Canongate), and spins a tale of murder and intrigue through a time of huge medical innovation in Scotland's capital. Can you tell us a little bit about when and where the idea for the book first germinated? Chris: The idea for the novel came from the research undertaken for Marisa's master's degree in the history of medicine. She was looking at the introduction of ether and chloroform at the Royal Maternity Hospital in Edinburgh where James Young Simpson was a consulting physician. Simpson was an intriguing character who mixed with all strata of Edinburgh society, ministering to the poor as well as the aristocracy. He lived in an unusual household where he saw patients every morning, made time to play with his children and held dinner parties where guests were encouraged to inhale anaesthetic vapours for pleasure. It seemed very far removed from the austere formality normally associated with the Victorian middle classes and we thought that it would make an interesting setting for a novel. A crime story was thought to be the best way of bringing all the elements of the narrative together, providing a means of exploring the class and gender divisions in the city. Writing a book is often seen as a relatively solo effort, as least until editors are involved. How did you find working together and how did you go about it? Marisa: There were many meetings around our kitchen table to discuss how to approach the project but working together still required solo effort – dividing up writing tasks and then reviewing each other's work to ensure consistency in tone and language, historical accuracy and plot coherence. It was a largely harmonious exercise although it took a while to get used to differences in approach; Chris has such a depth of experience and a writer's intuitive faith that the plot would reveal itself as the work progressed while my desire for order and structure required a little more explicit planning than Chris was perhaps used to. The Way of All Flesh weaves the stories of real life characters and events in with the fiction, how did you find that process? Chris: Once we had decided who our fictional characters would be – Will Raven, medical student and apprentice to James Young Simpson and Sarah Fisher, Simpson's housemaid - it became very satisfying allowing them to infiltrate the 'real' world of 19th century Edinburgh. That said, blending real historical characters and events with fictional ones is not without its challenges. There was some debate about which stories would fit with characters and situations we had created and not all of them could be slotted in. For the sake of a coherent plot without indulgent digressions some sacrifices had to be made. Edinburgh is a more than just a setting, it has a certain presence in the book. Chris: There was a very distinct geographical and economic split between the Old Town and the New Town in nineteenth century Edinburgh which allowed us to explore the very marked differences between the people who lived there. We also felt that Edinburgh's position at the time as a world leading centre in medical innovation deserves greater public awareness. You tackle huge inequalities and problems that were rife in the mid 19th century deftly, with a certain wry humour. But did you find it tricky to negotiate the sort of restraints your characters faced? Marisa: We tried to be mindful of the societal restrictions our characters would have faced, particularly Sarah. As a housemaid she would have worked very long hours, with little free time to investigate the deaths causing concern, so in the book this is one of the obstacles to her involvement that she has to overcome. Will we be seeing more of Raven and Fisher? Marisa: We have agreed to write two further Raven and Fisher books but given the volume of material we have to work with, we envisage there being several more. We have also agreed a deal with Benedict Cumberbatch's production company Sunnymarch to develop the novel as a TV series. Ambrose Parry will be touring throughout the UK during autumn. 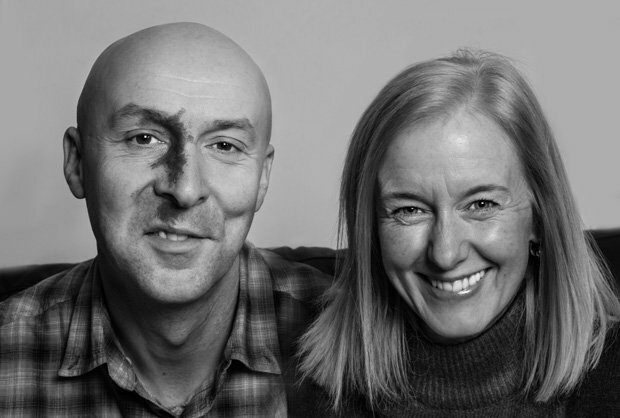 Catch the new crime writing duo at Wigtown Book Festival on Sun 30 Sep.
Chris Brookmyre and his wife Dr Marisa Haetzman, who write together under the pseudonym Ambrose Parry, discuss their latest novel The Way of All Flesh.